Former CEO, General Electric, Inc.
During Jack Welch's twenty years as the leader of General Electric, he became one of the best-known business leaders in the world. He made GE more profitable and more valuable by making its management structure less complicated and by focusing on the businesses where the company was most efficient. Some of his methods attracted a lot of criticism. But there are few corporate leaders who have received as much publicity or as much admiration as Jack Welch. "Dealing with the best team wins. This whole idea—whether it's a hockey team, a baseball team or a business—is the same: if you have the best team, you win." John Francis Welch Jr., known as Jack, was born in 1935 in Peabody, Massachusetts. His father John worked for the Boston & Maine Railroad as a conductor and was often away from home because of his job. Jack's mother Grace was a strong force in the early life of her only child. She encouraged Jack to do many things on his own, such as go to baseball games in the city alone, in order to make him independent. She also made him realize he could succeed in life, in spite of the fact that he spoke with a stutter and was one of the smallest kids in his neighborhood. She always stressed the importance of education. After graduating from high school, where he played four sports, Welch went to the University of Massachusetts at Amherst to study chemical engineering. He graduated in 1957 and went on to the University of Illinois for his masters and doctorate degrees. Immediately after he completed his studies in 1960, he took a job with General Electric, at a plant in Massachusetts. Managers there noticed he had an unusual combination of scientific knowledge and business sense. He also gained a reputation for rubbing people the wrong way at times, but his success at his job earned him the respect of his bosses. Welch moved up quickly through GE, becoming general manager of the company's plastics division and turning it into one of the leading players in that industry. He became a vice president of General Electric in 1972 and moved to GE's consumer goods and services division in 1977. He became a vice chairman in 1979 and was assigned to the GE Credit Corporation. This was where he really made his mark. He got the division to grow by entering into new businesses; his results were soon noticed by top GE executives. 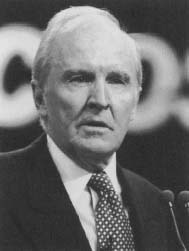 In 1981, Welch was named CEO and chairman of GE, becoming the youngest person ever to achieve this position at the company. He realized from the start that he needed to make some changes in order to stay competitive. He decided to reorganize the company by focusing only on those businesses that were strongest. During the course of this streamlining process, he laid off 135,000 GE employees—25 percent of the company's workers. By letting go of more than one hundred thousand workers after taking over the leadership of GE, Welch earned the nickname "Neutron Jack." The name comes from the neutron bomb, which wipes out all life but leaves buildings standing. Jeffrey R. Immelt, the man who eventually replaced Jack Welch as CEO of General Electric in 2001, told People magazine that working for Welch could be "fun" or it could be "terrifying." Businesses that were not ranked number one or number two in their industries were given an ultimatum to improve or be shut down. In the next five years, GE closed 73 plants and offices and sold 232 businesses. Meanwhile, all of GE's various companies were organized into three umbrella groups: manufacturing, services, and technology. While Welch's early moves as CEO were controversial, people soon saw that his tactics made the company grow and become more efficient. Opinions of him began to improve. His reputation was also helped because he believed in placing some of the decision-making power with the workers on the factory floors, rather than leaving it all to management. This helped the company act on good ideas that managers might not have considered, and also improved the workers' morale. At the same time that Welch was letting go of less profitable businesses, such as television sets and mining, he was buying companies in industries where he saw potential. Some of his purchases included the investment bank Kidder Peabody, the chemical company Borg-Warner, and RCA, the parent corporation of the television network NBC. The last deal, which cost $6.4 billion, was the largest merger outside the oil industry up to that time. Some of Welch's deals ending up causing headaches for Welch and for General Electric. When it was purchased NBC was the leader in television, but it started to lose ratings because of increased competition, especially from cable television networks. One of Kidder Peabody's top executives was put in jail for making deals based on information that was not public, known as "insider trading." Other scandals also occurred within the company during this period. Many members of the press and competing corporate executives questioned Welch's decisions. For example, GE suffered a $120 million loss because Welch decided to move into the business of making automation equipment for factories, but then could not find enough customers to purchase the company's products. He also stayed out of some lucrative businesses that could have boosted company revenues. For example, he turned away from developing magnetic levitation (maglev), a new transportation technology, preferring to remain involved in traditional railroad equipment, which was not a growing industry. Despite these setbacks, Welch's reputation as an admired business leader grew. His methods of managing, which allowed employees to have a say in management decisions, were embraced by many other companies. Welch put company-wide quality initiatives in place and pushed GE to the Internet as a means to make the company more efficient. Probably the most significant factor in Welch's good reputation came from the fact that GE's value grew strongly throughout his twenty years as CEO. At the end of Welch's career, he suffered a big business disappointment. He wanted to purchase Honeywell International, which made electronic equipment for airplanes. Its business fit well with GE's airplane-engine manufacturing operations. The two companies worked out the details for what would be history's largest industrial merger. The snag came when the newly formed European Union, the government that oversees matters affecting most of the countries in Europe, refused to grant permission for the merger. The EU required too many changes for GE and Honeywell to accept, so the deal fell apart. Welch retired from General Electric in 2001. His memoir, Jack: Straight from the Gut, which was one of many books Welch wrote over his career, became a best-seller as executives looked to his words of advice. Welch's personal reputation suffered in 2002, however, when an editor at the Harvard Business Review, Suzy Wetlaufer, announced she was having an affair with the former CEO. Welch and his second wife, Jane, divorced shortly after the affair came out in the news. Welch had married Jane in 1989 after divorcing his wife of thirty years, Carolyn, in 1987. At the time of jack Welch's retirement in 2001, GE was the most valuable company in the world. Financial analysts estimated it was worth $490 billion. When Welch took over the company two decades earlier, the value was $14 billion. Despite this scandal, Welch's reputation as one of the most admired and well-known business leaders in U.S. history—and probably in the world—is likely to stay intact. Newsweek magazine, while questioning what the Wetlaufer affair would do to his reputation, noted that Welch was considered the best manager in the last 50 years—high praise for a business leader. Campbell, Robert. The Golden Years of Broadcasting: A Celebration of the First 50 Years of Radio and TV on NBC. New York: Rutledge/Charles Scribner's Sons, 1976. Slater, Robert. The New GE: How lack Welch Revised an American Institution. Homewood, IL: Business One Irwin, 1993. Sobel, Robert. RCA. Briarcliff Manor, NY: Stein and Day, 1986. Weaver, Pat, with Thomas M. Coffey. The Best Seat in the House: The Golden Years of Radio and Television. New York: Alfred A. Knopf, 1994. Welch, Jack, with John A. Byrne. Jack: Straight from the Gut. New York: Warner Books, 2001. Gibney, Frank, Eric Roston, James Graff, and Joseph Kirwin. "How Jack Fell Down." Time (July 16, 2001): p. 40. Jerome, Jim. "Electric General: The Corporate World's Boldest Boss, Jack Welch, Gears Up to Chill Out." People Weekly (November 5, 2001): p. 56. General Electric, Inc. [On-line] http://www.ge.com (accessed on August 15, 2002). National Broadcasting Corporation (NBC). [On-line] http://www.nbc.com (accessed on August 15, 2002).